It's getting warmer around these parts, so a nice light beer is needed. Session beers are all the rage nowadays with every brewery in the country trying to see how much flavor they can throw into a low abv beer. Mostly, it's all about sessionable IPA's, but I think it's better to put that spin on a style that is already low in alcohol content. Enter the American Blonde Ale which is naturally lighter. 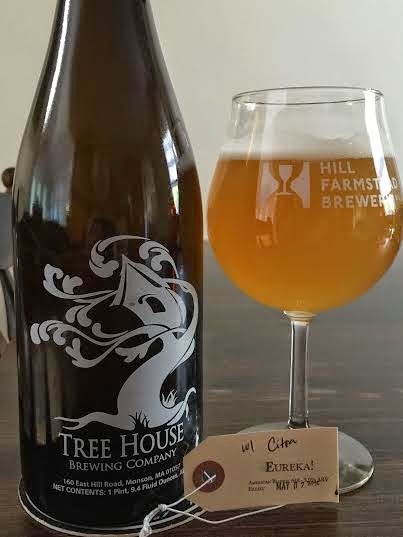 We're looking at Tree House's Eureka! series with this version being hopped all with Citra. Pours a hazy, light orange with a finger of pure, white head. Aroma is light, crisp, and lemony with a noticeable hop dankness. It smells a lot like a really hoppy lager. The taste is actually malt-forward with some big biscuit, cracker, and bready flavors. Following that immediately is some lemon zest with grassy hops making themselves known in the middle of the tongue. As it sits in my mouth, the bitterness is surprisingly strong and leaves an impression, but the finish is crisp and clean like a well-made lager. I'd compare this more a classic Kolsch than anything else. Mouthfeel is light, but also full of flavor. For the style, it is full-bodied because at no point would I ever describe this as thin or watery, which is quite the feat for 3.90%. It doesn't fade away in the finish and the big, bready, malt presence doesn't leave the mouth feeling dry. Refreshing indeed. Eureka! with Citra is definitely the light, sessionable beer I expected it to be, but with much more to offer. This full-bodied, hoppy, bready, and lemony beer will make you think you're sipping on a quality lager or Kolsch. Truly an achievement in the Blonde Ale category.